How are you all doing? Hope you had a great weekend! From last two weeks mercury has dropped and there is a cold wave. This year monsoon was prolonged in most of the part of our country and especially in Bangalore it extended for a longer time. After the monsoon hardly there was a gap of few days and again rain started due to northeast return monsoon. Since the temperature is dropped there is a feel of 'Winter' in the air! Winter means baking cakes...that is what I can relate from my childhood memory...Though now the scenario is not the same, we bake cake on every now and then... But still some of the childhood memories are so special..
Few days back I baked a cake after months.. 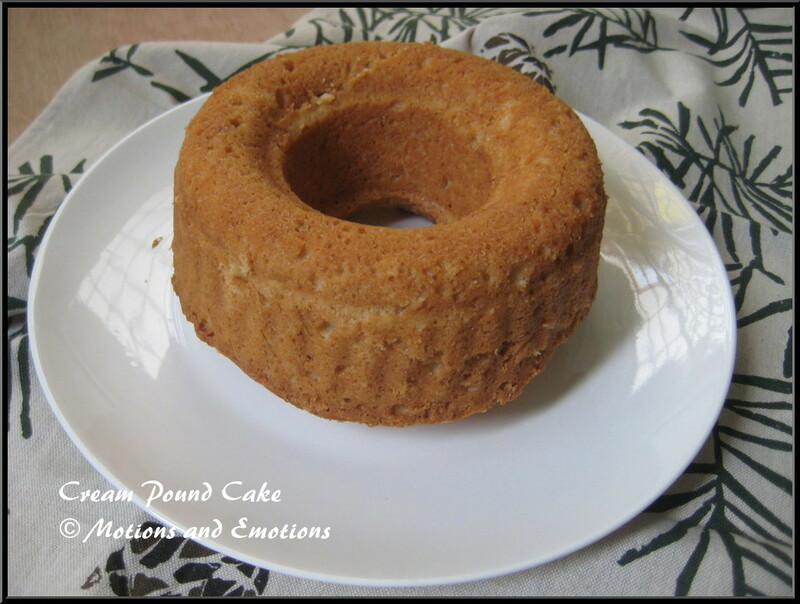 It was a cream pound cake.. By now readers must be knowing about my love for naked cakes. When my better half was telling again and again you did not bake a cake for a long time and I know I did not do because of piled writing projects. I had a pack of fresh cream in the refrigerator and wanted to finish it before the date expires. 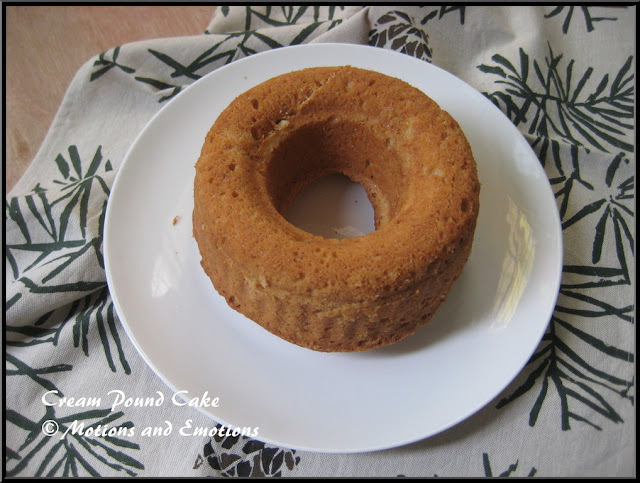 Immediately thought of using a cream pound cake or cream bundt cake. Normally bundt cakes are glazed with dressing but I have not used any dressing as I like the cake just like that. This fresh cream cake has turned out soft and moist and needless to say everyone finished it soon. Often we have unfinished cream tetra pack in our refrigerator and we are not sure how to use it. 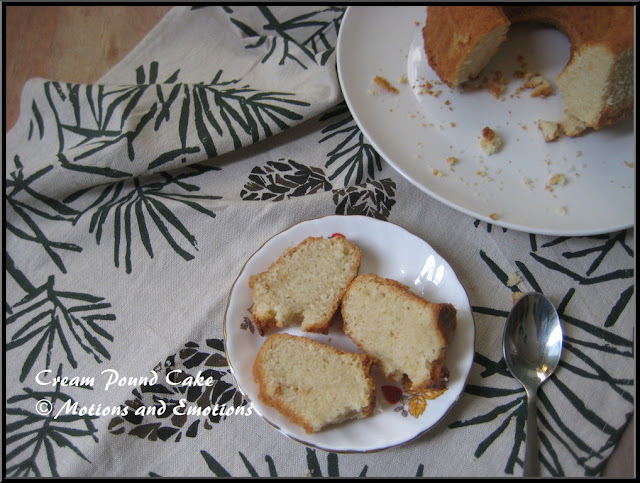 So here is an easy and tasty cake to use the cream pack. Do try it and share your feedback. 1. Preheat the oven at 165 to 170 degree C for 10 minutes. 2. Take a bundt pan or loaf tin and grease it well with butter or oil and keep ready. 3. Sift flour, baking powder and salt together and keep aside. 4. Take melted butter in a big bowl and add refined oil into it. 5. Next add sugar into butter-oil mixture and cream it. 6. After that add egg one at a time and beat the mixture well. 7. Add vanilla essence into the mixture and beat well. 8. Finally, add flour mixture and cream alternately to wet mixture. 9. Now pour the batter into prepared tin and keep it into the preheated oven for 35 to 40 minutes or until a tooth pick comes out clean. 10. After that allow to cool it and carefully unmould it, later cut into pieces. You can serve them or store them in air tight container for 3 to 4 days. Tips: Eggs and Fresh cream should be in room temperature before you use them in your cake. Never tried pound cake with fresh cream.. Sounds so delicious!! Yummy share!! Cake definitely stands as a pride and joy.